Ultra thick Bakery Style Chocolate Chip Cookies feature golden brown edges with ooey and gooey centers. This easy recipe can be made in 30 minutes! Download my free Cookie Customization Guide here! Taste: Full of sweet butterscotch & chocolate flavors, exactly how a chocolate chip cookie should taste! Texture: Thick and chock full of gooey chocolate with slightly crisp edges. Ease: No special ingredients, equipment, or skills needed! Pros: Easy everyday delightful chocolate chip cookie recipe. I think you’ll love this one. Would I make this again? I’ve already made this recipe many times and have the dough in my freezer for when the craving strikes. My favorite type of recipe to bake is absolutely COOKIES. They’re so fun and simple but they can teach us SO much about the science of baking. My Ultimate Guide to Chocolate Chip Cookies is still one of my most popular posts. It’s been visited by over half a million people! That post actually inspired the creation of my eBook: The Ultimate Cookie Handbook. And almost 2,000 of you have purchased that book. So I think it’s clear that we’re all obsessed with cookies here. That’s why I’m SO thrilled to be sharing this recipe with you today. In my opinion it’s the perfect easy everyday chocolate chip cookie recipe. They’re simple to make, and yield thick beautiful cookies that are golden brown and crisp at the edges, while remaining gooey at the center. Watch the video below to step into my kitchen and see exactly how to make this recipe. I give tons of tips and tricks for getting perfectly thick cookies, and you can see what every step should look like! There’s actually a time-lapse video shot of these cookies cooling right after I took them out of the oven. You can see that they hardly shrink or deflate as they cool. If you only beat the butter and sugar for 2 to 3 minutes max, your cookies shouldn’t deflate! The key to thick cookies is to use enough flour in the dough so there’s not too much moisture, but also to make sure the dough isn’t too warm. That’s why you want to make sure to use butter at a COOL room temperature. If your dough is too warm when it enters the oven the cookies will spread out and become thin. Bonus tip: Pop your balls of cookie dough in the freezer while your oven preheats to make ultra thick cookies. I talk about the benefits of “marinading” your cookie dough for at least 24 hours in the video above. Not only can you refrigerate cookie dough for up to 72 hours to make it ahead of time, but you can also think of this like marinading a steak. The butterscotch flavor of the cookies will intensify. The flour will also absorb more of the moisture in the dough during this time. The resulting cookies are more flavorful AND thicker and chewier. So if time permits I’d definitely give this a try! Another trick is to use a large cookie scoop to get nice and thick cookies. The best cookies are the freshest, there’s no magical way around that. However, here’s a few tricks to keeping them fresh and soft for as long as possible! I love cookies straight from the oven the best. I always keep pre-scooped balls of cookie dough in a Ziploc bag in my freezer so I can bake cookies off and have them warm from the oven in a matter of minutes whenever I want. Here are more tips for freezing cookie dough. But for those times when you need to keep already baked cookies soft, there are my tips. First of all, most cookies can be stored in an airtight container at room temp for up to 5 days. Be sure they are completely cooled before storing. To keep them soft, you can add an apple wedge, piece of bread, or a tortilla on the top and bottom of the cookies to the container a day or two after baking them, or whenever you find the texture starting to harden. The moisture from the bread or cookie will migrate to your cookies, making them soft and chewy again. A tortilla is a new favorite of mine because it takes up much less room than a slice of bread, and doesn’t transfer any flavors or aromas like an apple wedge. Not to mention it fits into a round cookie tin pretty perfectly. What I like to do is reheat and refresh the cookies in a 350°F oven for 3-5 minutes. Your toaster oven should work just fine. This improves the texture and there’s nothing like a warm chocolate chip cookie! I always have cookie dough in my freezer. This recipe in particular freezes beautifully! 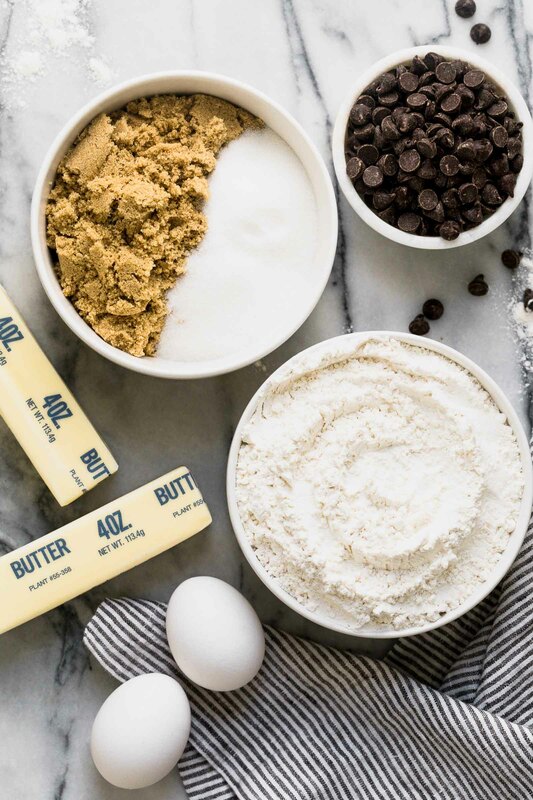 Check out all of my tips for freezing cookie dough here. See ALL of my chocolate chip cookie recipes & cookie baking tips here! In the bowl of an electric mixer beat the butter, granulated sugar, and brown sugar until creamy, about 2 minutes. Add the vanilla and eggs. Gradually beat in the flour mixture. Stir in the chocolate chips. If time permits, wrap dough in plastic wrap and refrigerate for at least 24 hours but no more than 72 hours. This allows the dough to “marinate” and makes the cookies thicker, chewier, and more flavorful. Let dough sit at room temperature just until it is soft enough to scoop. Divide the dough into 3-tablespoon sized balls using a large cookie scoop and drop onto prepared baking sheets. Bake for 12-15 minutes, or until golden brown. Cool for 5 minutes before removing to wire racks to cool completely. Although I prefer cookies fresh from the oven, these can be stored in an airtight container for up to 5 days. See post for storage tips. Yum, I am a huge cookie monster and chocolate chip is my favorite, will definitely have to try these! Hi Tessa! How many days will these cookies stay tasting fresh for? How long will these cookies stay fresh? I want to make about 100 of them to take on a 5 day trip! Thank you so much for this recipe! I have searched for a great chocolate chip cookie recipe and this is it!!! I just made a batch and feel sick from eating too many. 🙂 I baked them straight away but am looking forward to refrigerating or “marinating” the dough the next time. Thanks again for ending my search! Haha!! This makes me so happy. I’m curious – did you find the cookies improved after refrigerating the dough? So I made these and followed the recipe exactly and they came out AMAZING! I made another batch but used dark brown sugar instead as I had no light brown sugar, refrigerated them for about 16 or so hours, took them out and baked them about 30 min after they came out of the fridge ( still hard to scoop at first) and they are so so oily! I used parchment paper ( no spray at all), not sure what happened this time around, they seemed to have to cook longer but now have that weird over cooked taste but wet look, any suggestions? I made this dough last night and baked them this morning. They are SO GOOD! 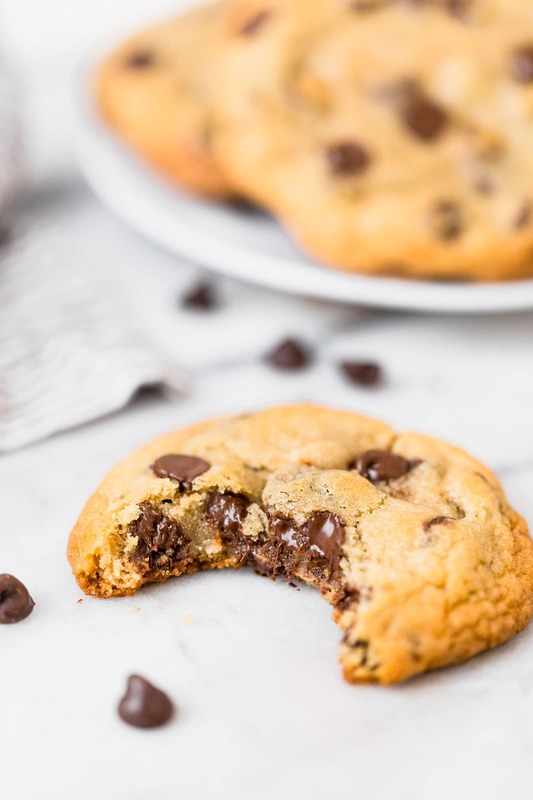 I have tried so many chocolate chip cookie recipes looking for the perfect one and these might just be it! I used half semisweet chips and half bittersweet chunks and they were perfect. These are thick, soft in the middle, crisp around the edges and absolutely delicious. I would definitely recommend baking these bakery style chocolate chip cookies as soon as possible. Wishing I had not given them all away now as I drool on my keyboard. Haha. Thanks Tessa for another great recipe! These are the best chocolate chip cookies that I have ever made! I wasn’t a fan of chocolate chip cookies but now I am! I used vegan butter, egg subtitute and sucanat sugar (after grinding). I broke off a piece of the dough and put it in the fridge for about six minutes and about 10 minutes in the freezer. The rest I kept in the fridge for 24 hours. The freezer batch did not fall. I’ll find out about the rest of the dough in two days. But, yes I will keep this recipe and make over and over again. These are my new GO TO chocolate chip cookie recipe. Will be making these for my grandkids!! I made these cookies today. They tasted amazing, but spread a little bit too much even though I followed your recipe exactly, using kitchen scale. What did I do wrong? Made the dough last night and stuck it in the fridge. Baked a batch of cookies for an after-dinner treat tonight. After taking one bite, my husband looked at me and said, “from now on, don’t make chocolate chip cookies using any other recipe.” Thanks so much for the recipe! It was a hit in our house! So so good. I put a batch in the freezer while my oven heated, like you recommended. Nice and plump cookies, crispy on the outside, soft on the inside. I’m freezing the rest. I bought my own oven at taobao and i will take it today from 4PX! I am soooo excited to try this! It will be my first cookie baked on my new 30L oven from TAOBAO! I hope we three (me, oven and your recipe of Bakery Style Choc Chip Cookie)can be good friends the first time haha! I made these….I thought I followed it to a “tee”. But I must have done something wrong. They taste good but they came out completely flat. And they all ran into each other on the baking sheet. Not sure what I did wrong. Thank you, Tessa, for your wonderful website and delicious recipes. I use TONS of your recipes!!! These are hands down the best chocolate chip cookies I’ve ever made! They are super easy to make and my entire family loves them! Thank you Tessa for the magnificent recipe! I found this recipe after I followed another chocolate chip cookie recipe that ended up being flatter than a pancake with chocolate chip bumps. I have tried several chocolate chip recipes over the years & stopped trying because they never come out how I want them. My niece is home from college for spring beak & asked for chocolate chip cookies – of all the cookies I make well, she had to pick the one I cant make if my life depended on it. Until now….. I made this recipe exactly as written – weighing the ingredients instead of measuring – & they came out AMAZING!! My sister & niece said these are the best chocolate chip cookies they have ever had. They are still raving about them days later. Thank you for sharing such an amazing recipe. What an amazing looking recipe <3 Just wondering, is there any way I could simply replace butter with olive oil? Or canola or coconut oil? Thanks ! I just made your cookies and they are awesome!! Thank you so very much. This cookies are amazing. My husband likes crispier cookies. I’ve ready your cookie guide and thought of inverting the sugar measurements. Would I need to tweak anything else? Thanks for all your baking experiments so we don’t have to go through it. how would I make this in a 12″ pizza pan? I’m in 6th grade and I want to be a kids baking champion. I tried this recipe and my little brother loved it I also want to open up a bakery when I made this recipe and saw that everybody LOVED it it made me feel good about myself and made me feel empowered;that I can accomplish my goals! Thanks for everything! Hi, This recipe was soooooo delicious, I absolutely love the taste. The outside is crunchy and the inside is nice and chewy. However, my cookies did not spread as much as I would have like them to and I did make sure to use baking soda. So I am not sure why my cookies didn’t spread overall the taste was great so absolutely loved them. Try reducing the flour by 2 tablespoons! Can the Bakery Style and Ultimate Chocolate Chip cookies be baked on a Silpat mat?? Best chocolate chip cookie recipe EVER! My new go to recipe… My co-workers are going to love these! These cookies are DELICIOUS! I chilled the dough for 24 hours. Mine puffed up quite a bit, and we’re so chewy and gooey inside. My new go-to cookie recipe. Thank you!! Flower or corn tortilla? Raw or cooked? This recipe is the bomb! I have been trying chocolate chip cookie recipes for about a month and this one is perfection! I love the thickness, gooey center, buttery taste and the flavor is the best! I chilled them in the fridge a little over 24 hours and the difference in flavor is just so much better! I can now quit looking for the perfect recipe for I have found it! Thanks so much for sharing! I just made these….they where great….but I added 2 packs of chocolate chips…..Yummy! These sound great but I’m confused a bit. I have always understood and experienced baking soda to flatten cookies and baking powder to add volume. As yours calls for 2 tsp rather than 1 for the amount of butter compared to the rest of ingredients. I want to try these but will make half batch first to see how they turn out for me using my scale as well. Followed the recipe exactly. Made a test batch of 6 cookies right after mixing. Baked as directed at 350 F on the convection setting of my oven. They were very tasty, but seemed more “cakey” than I expected. I put the remainder in the fridge overnight and baked the rest at 350 F but not on the convection setting this time. These were much better!! Soft, chewy, and gooey. Much less “cakey” this way. 12 minutes was the perfect baking time for my oven. Thanks for sharing! Wow! I love these cookies. Especially the ones that have chocolate drops .. I spend a fortune buying them at the supermarket, without having the slightest idea that they are not complicated to be prepared. Very good! Thanks for the content .. it will make me save a lot and I will definitely eat them made on time ..
Hi, thanks for this recipe. It worked out beautifully for the small batch I made before refrigerating the dough. For some reason after refrigerating, they spread a lot more and were not as thick. Any ideas why? Also, any suggestions for how to not have every sheet of cookies turn out differently? For some reason that’s how mine seem to go! Thank you! i followed the recipe perfectly and the cookies came out amazing! The best recipe i have ever used. I am selling these cookies at school so i can share the joy. Can’t wait to try this recipe again! Re Jens complaint about using dark brown sugar and ending up with an oily taste and a stronger taste…. i think that there is more molasses in the darker sugar which might explain the difference and the overbaked taste would be the darker sugar carmelizng sooner. What you might do next time is to increase the white sugar and decrease the dark brown sugar. By far the BEST chocolate chip cookies I’ve ever made! Haven’t baked my cookies yet as they “marinating”., but the dough tastes awesome! I just wanted to point out that the eggs are missing from the written step by step. I noticed that someone had dry cakey cookies which missing the eggs when creaming surely would cause this. Happy baking! After seeing this post, chocolate chip cookies are ALL I am craving. These look so delicious, soft but crisp on the outside and chewy – just how I like them! Hi Tessa, I am a bit confuse on the All purpose Flour, is it 3 cups or 1 cup but in Grams it says 380 grams. Isn’t it 1 cup is equal to 340g? I bake the cookie but its hard. Thanks and more power.I am learning many things from you. God bless! Ugh, my office mates are going to hate me. I’ve made this recipe 4 times within the last two months and have brought them into work. They are AMAZING. 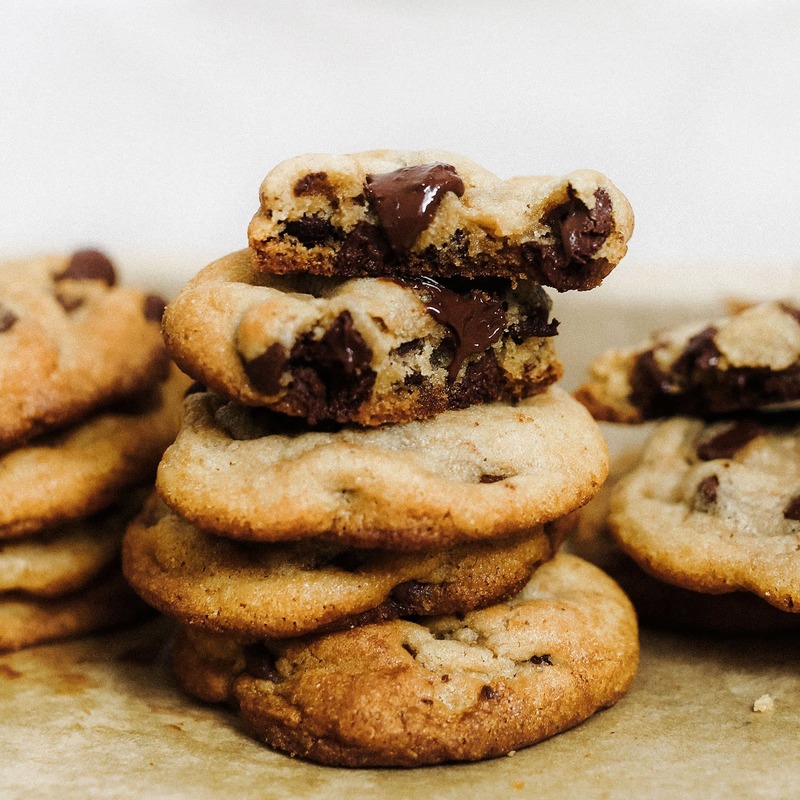 The absolute best Chocolate Chip Cookies, ever. This will forever be my go to recipe. I literally cannot stop making them. Amazing! This recipe is absolutely the best chocolate chip cookie recipe I’ve ever found. It has the right amount of salt to balance the sweet and the cookies are big and chewy. So good! Too bad I’m making them for someone else or I’d eat them all myself! Hahaha. Thank you for this recipe!! Can I use ground oatmeal for part of the flour? How much would you suggest? Can’t wait to try this recipe! This is by far the best cookie recipe I have EVER made. Watched the video and made exactly as how she advised, kept in the fridge for over 24 hours, portioned and put back in the fridge until I was ready to bake. They came out so delicious, thick, and gooey. I usually never write reviews, but this recipe was just SO good I wanted to do it the justice it deserves. Highly recommend making these! 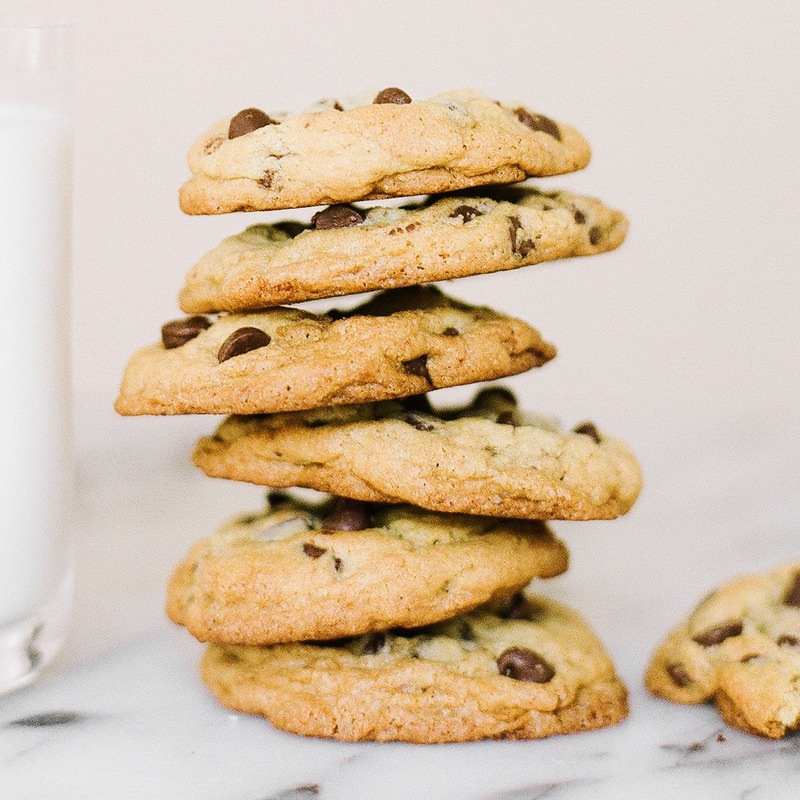 My son and I made 3 different recipes for chocolate chip cookies this week and these are by far the best……….or we just nailed this one. Thanks for the recipe! Mine don’t spread in the oven so they came out puffed up like mini cakes. I baked them for15 mins and golden brown on top. Thanks for any advice! These cookies didn’t taste like the ones from the bakery, they tasted like the cookies my dogs make. This recipe makes the BEST chocolate chip cookie ever!! It is also the first chocolate chip cookie recipe that I follow and it comes out looking EXACTLY like in the video! measuring by grams truly does the magic! Until now, I made this recipe 3 times! And everyone who eats one ALWAYS compliments it!! A friend of mine said once that they taste just like the cookies from Subway! I’ve had a problem with the cookies flattening out as they bake and the trick was to freeze them and adding 10 more grams of flour! (flour in Germany is a bit different than the flour in the US). I froze my last batch for a couple of days, which improved the taste of the cookies! Thank you very much for taking your time and developing this devine recipe, Tessa! I wish you could see a photo of the cookies that I made following your awesome recipe. Hi, Tessa! Your chocolate chip cookies look heavenly & I cannot wait to bake them this weekend! I would like to know if I may substitute all-purpose flour with wheat flour instead. Please advise. Hi, I was just wondering what is the best flour brand to use for this recipe? Can you tell me why the cookies came out cakey….I followed the instructions exactly yet the color was too light and the cookie was cakey… is there a certain flour I should use? I used cannabis butter for this recipe and wow its a great one! Hi, I followed the recipe to the letter and the cookies turned out absolutely amazing. The kids gave their seal of approval. Pity they won’t get to eat the rest as they are for a fundraiser! I will however, be making them again as they are soooo good! Can I use whole wheat flour for this recipe or coconut flour? I just made a batch of these babies! They are amazingly delicious!! The sweetness is just right. The crispiness of the sides lasts long for I left it displayed on the deassert table at a party. Did everything in what the recipe said, it turned out perfect!! 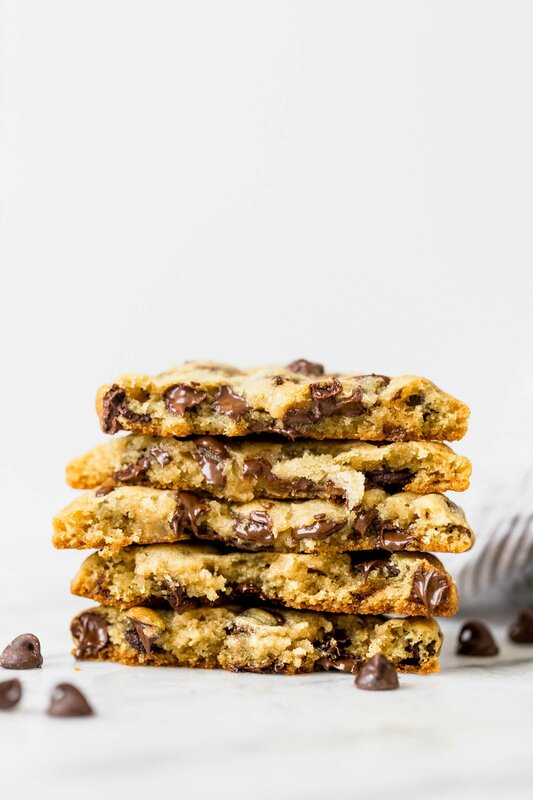 This is now my go to chocolatw chip cookie recipe! I was so excited to so this. Guess what? it was my ever first time ever baking cookings EVER! Thank you so much for the recipe! This has been our family CCC recipe since the day you posted it! Perfection! I just sent a double batch to my son at college and he made quick friends sharing in his freshman dorm! Thanks for your great tortilla tip— I slipped one in each ziploc bag to stay fresh and it worked! Of course it was only needed for shipping time because once they arrived, the cookies disappeared as soon as he opened the box!! Just wanted you to know your part in sharing some love across the miles. What is the difference between this cookie recipe and your Ultimate Chocolate Chip cookie recipe? Great recipe! Definitely one to keep! I made sure to follow the instructions carefully and the result was gratifying! I kept the dough in the fridge for about 14 hours and baked the cookies for 15 minutes. I made the batter, placed in the frig ovenight. Took out the next day. After 30 minutes scooped to bake. Was still a little hard. After baking for about 15 minutes, they were a little thicker than I thought they would be. I used a 2.4 inch/6 cm scoop. Why? Good flavor but not a fan of the texture. These came out too puffy/cakey for my liking, compared to other recipes there is a lot more flour in these than I normally use 2-2.5c vs. the 3c in these). I didn’t get crispy edges and a gooey center from these, not even when I used melted butter and all brown sugar. Have made these once before both making some right away normal small sized and making some after chilling the dough jumbo bakery sized. The recipe is written for perfection, follow it! These cookies were amazing when they were allowed to marinate and bakery sized. My fiancé claims he “does not like sweets” but the leftover cookies also went MIA overnight! Currently refrigerating the dough now with a small amount put aside without chocolate chips (atrocious, I know). Patiently/not so patiently awaiting the perfection that I know will be in my belly tonight! Tessa I have been following you for a while and I have to say, these cookies are the BOMB!!!! I have enjoyed reading your articles and test results. This is the first time I have actually tried any of your recipes…I’m so glad I did. I have been making chocolate chip cookies for 44 years and although my cookies are good, I was still searching for the perfect chocolate chip cookie. I have tried numerous recipes but they would not meet my standards for the perfect thick, chewy, ,gooey cookie… UNTIL NOW!!!! I followed the recipe exactly except for the salt. I didnt have fine sea salt so I used regular salt but only 1/2 tsp. because I was using SALTED BUTTER. OMG!!!! These are the HOLY GRAIL of Chocolate Chip Cookies and will be my new recipe. KUDOS to you TESSA and THANK YOU for all your articles and recipes. They were so good! They came out looking a little dome like probably due to the amount of flour used but that did not bother me at all, they tasted delicious. I made this cookie recipe because I was amazed by the good reviews. My cookies taste good and look good too, but a little cakey, although I followed the recipe well. I even put the dough in the fridge to “marinate” it. I don’t know why they didn’t become chewy. I will try to make it again, maybe with less flour? This is now my favourite cookie recipe. I love the marinating them & you are right it does improve the flavour. i think i use more flour, No video for this recipe? Can I just leave out the sea salt if all I have is salted butter? Made them yesterday but i didn t have time to put it in the fridge first..
everyone loved it but the cookies came out thin and in a huge size in the oven..maybe the butter was too soft i dont know..could i use less butter instead the next time? Hello, I’m just curious about the eggs. Is there a drastic difference in the way the cookies come out if the eggs come straight out of the refrigerator? I tried these cookies yesterday. I made them and froze them and yesterday I thought why not bake them and omg they are by far the best chocolate chip cookie I’ve ever made. Thanks so much for sharing it! As to the cookies, they were inedible. I have no idea what happened, because I’ve made cookies a billion times before and never had to throw out a batch of dough but… yeah, that’s what happened. I was tempted to blame you and give you one star, but surely it COULDN’T be your fault because the ingredients all make sense… and yet it couldn’t be MY fault because my ingredients were fresh and I know how to bake. Yum! These cookies look amazing! I can’t wait to make them for my parents! These cookies are divine. Served them at my birthday party and all the guests were thrilled and asked for more. The absolute best chocolates chip cookies I have ever made. I have never posted a review for a recipe I have made, but had to for these. I made my second batch tonight and followed the directions even more closely after watching the video and they came out even better. These will be my go to cookie recipe for years to come. Thank you! These are super tasty! I made them with half whole wheat, half all purpose flour, and 1/2 T extra oil. The perfect blend of slight crunch, but still soft! AMAZING! My husband and kids loved them! They couldn’t believe I made them from scratch they were so good. They came out thick and perfectly cooked. The best recipe and my go-to from now on. Thank you! Hey, just want to ask. Can i use normal chocholate, my local store don’t have chocholate chips in store. These cookies look delicious! My mom is allergic to eggs, is there anything else that could be used as a replacement for the eggs in this recipe? Like an egg free cookie? Awaiting your response. Hi there! I’m sorry, but I haven’t found any alternatives to eggs for this recipe that produce the same results. The first time I baked them it was so good. It was so perfect in terms of flavor and appearance that I wanted to bake it again. I baked gain today however, the cookies didn’t spread. I don’t know what happened please tell me what I should do to avoid this from happening again. Nevertheless, the flavor was still there but the appearance wasn’t that great. I love all the tips and tricks you publish! I can’t wait to try them, but I don’t see the video. Am I missing something? I made these cookies to take to work for a holiday party and they were a huge hit! They are so delicious!! Thanks for sharing this recipe. I’ve made these cookies 2 days in a row. The first time I “marinated” the dough for 24 hours. The second time, I did not. The first batch of cookies came out just okay. They were a little lumpy and they were edible, but I wasn’t “wowed” by them. The following day they tasted much better. The second batch that I made today came out much better. They looked more like cookies and not lumps and tasted good right after they cooled down. I will continue to use and try to perfect this recipe. I haven’t changed any ingredients. I do think I might reduce the salt a little and maybe the flour too. I will also try to marinate the dough for a full 72 hours to see if the flavor changes. I noticed no changes in flavor from the 24 hour marinate. Thanks again! Can you make these cookies without a hand mixer or stand mixer?I’m really keen on making these cookies but I do not have a hand/stand mixer. I hope I can’t can still as I really a mom craving some good chewy chocolate chip cookies! Tessa, I am 65 years old and needless to say have been making cookies for many years. I was looking for the perfect recipe and yours is it!! I used dark brown sugar, I didn’t use the mixer not did I refrigerate the dough and I only baked one sheet at a time for approximately 12-13 minutes. I had some special dark chocolate chips about 1/4 cup that I threw in also. They absolutely were perfect and delicious! I think the difference is adding more brown sugar (which I think lends to the chewiness) than white sugar and the 2 teaspoons of vanilla. Thank you for a great recipe! I will be throwing the other recipes away. I want to thank you for this wonderful recipe! Y’all, look NO further. This is it! Follow the directions, weigh your flour and sugars. Pay attention, preheat the oven, FOLLOW THE DIRECTIONS, don’t play grammar police just follow the recipe. Use common sense! If you need to make a bunch of substitutions maybe try a different recipe. Sorry for the mild rant I just had to scroll through many ridiculous comments to leave this lady a compliment for bringing back childhood memories. 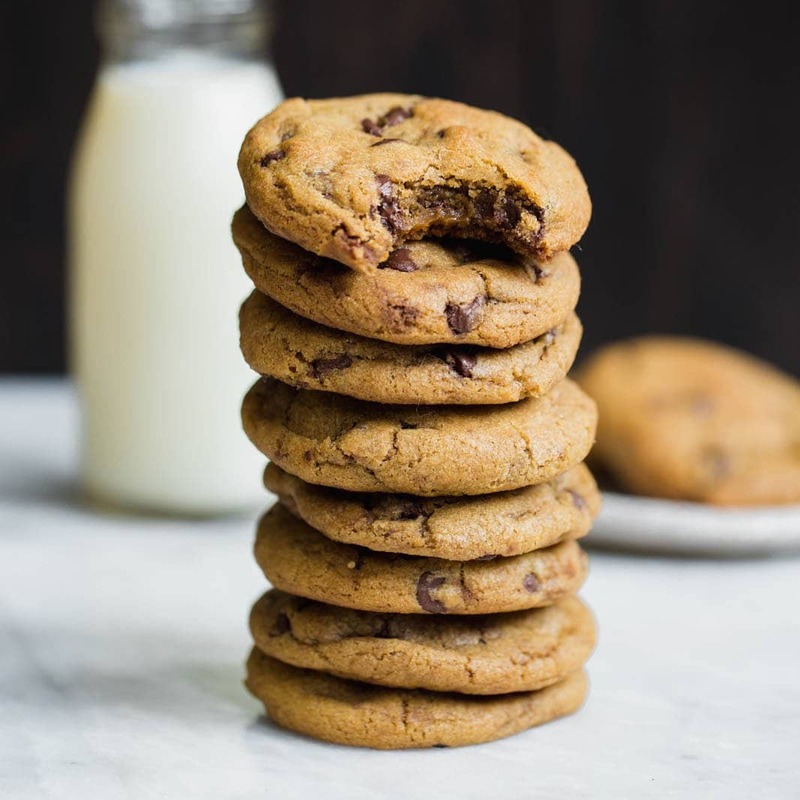 This is the only recipe I’ve found that reminds me of cookies I had as a child (I’ve made these cookies multiple times now and they are wonderful every time) The dough freezes well, stays fresh in the fridge for a few days…everything she says it does. Thanks again! Hi, I just wanted to know if I could use cake flour instead of all purpose flour for this recipe? Thank you in advance! Made these today and I have to say these are the best homemade chocolate chip cookie I’ve ever made. I followed the instructions but only baked 11 minutes. They turned out crunchy around the edges and perfectly soft and chewy inside this is a winner, so glad I found it! Hi Tessa, I am definitely trying out this chocolate chip cookie recipe today. Please, can I use this recipe for commercial purposes? I made the dough and am pleased with the consistency (my first time with a mixer, I only got it last year, I’ve always mixed everyrhing my hand. wow so much easier!). Didn’t notice the chill time as I glanced at the directions before attempting to make this recipe. You might want to move the preheat step to after the chilling step. I look forward to tasting the cookies tomorrow! I did divide the dough in half and mixed chopped nuts (Brazil, pecan and hazelnut) into one bowl. Correction, I meant the 380 grams of flour as listed. That came out to 2 1/3 cups. I used a recipe downsizer to make fewer cookies, and they looked and tasted so good before I put them in the oven. Unfortunately, when I took it out they were dry and tasted bad. Weird. The recipe is back! Thanks from me, my family and friends, all of whom have been enjoying these cookies! 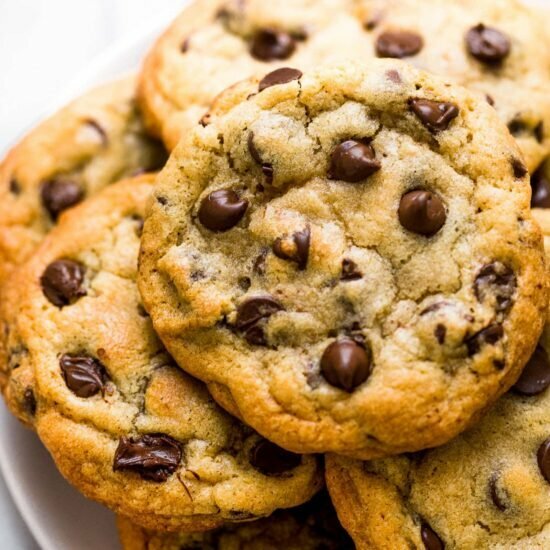 These are absolutely the BEST chocolate chip cookies! They are perfectly crispy on the outside and gooey in the inside. I love the tips for freezing the dough. It has saved me a ton of time! Can I add walnuts to this recipe? Hi Tessa, can i replace the all purpose flour with cake flour? I followed the recipe but did cook half of them right away. They are perfect!!! Thank you for sharing. These are the PERFECT cookies! I found this recipe during December of last year and have made them at least 10 times. Most of the time, I can’t even get the majority of the cookie dough to the oven before my hubby and daughter gobble it down. It’s definitely my go to recipe now! Holds up well no matter when you make them! Whether it’s right after you make the dough, after sitting in the fridge for awhile or after freezing, these are the best! The one and only thing I changed is reducing the salt a bit because my first batch was a bit on the salty side. Favorite chocolate chip recipe ever! Thank you for this recipe I am so excited to try it!! I wanted to ask if I could use dark brown sugar instead of light brown sugar? I am not sure what the difference is when it comes to baking both of these types of sugars…I would love to know! Sure, you can use dark brown! It’s official: This is the ONLY chocolate chip cookie recipe I will use right up until the day I die. When I found it sometime last year I was a bit hesitant because I had already been through so many mediocre recipes, but my family and any visitors who drop by go absolute gaga over them. I can’t even count how many times I’ve made these. My husband usually brings the majority to work, and his co-workers constantly request that I make more. This recipe is my holy grail; thank you so much, Tessa, from saving my family from sub-par cookies! Great recipe and the cookies look fab! Do you have a Gluten Free version by any chance? Wow. I just baked these and they are just DIVINE. Perfect flavour, texture, everything. I wanted some cookies that tasted like home (I’m American living in Australia) and this recipe nailed it! Thanks for the recipe! Tessa, what a gorgeous idea! We absolutely love cookies! Definitely need to try these! Hi! I want to make these tonight and freeze to bake in 2 or 3 days. Will the cookies hold up? Also- how many cookies does one batch make? Looking forward to making them! •	What do you think went wrong ??? These cookies are very good. I will use less brown sugar next time so they dont spread as much. It’s the granulated sugar that actually encourages spreading. Try popping the tray of dough balls in the freezer while the oven preheats to reduce spread!